Our technical articles on pipe pressure drop calculations and flow rate calculations are provided for reference purposes, to guide the user in their understanding of the equations that are used in the engineering of, and design of pipe systems. For legal reason we make the following statment. While we always try to make sure that the technical details which we publish are correct, we cannot guarantee this and furthermore we hereby state clearly that we accept no responsibility should there be any errors in our documentation, and we take no responsibility in relation to how this information is used. The Pipe Flow Expert and Pipe Flow Wizard software programs use the Darcy-Weisbach method to calculate friction loss in pipes since it is generally accepted that this equation, together with the friction factor obtained from use of the Colebrook-White equation, gives the most accurate solution for non-compressible fluids and works well for gases and compressible fluids when operating within certain design criteria; see the Pipe Flow Expert User Guide section on 'Working with compressible fluids' for more information. 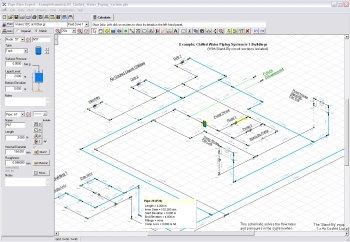 The Pipe Flow Expert software contains a full set of Help information and a full User Guide in PDF format, both of which can be accessed from Help menu while the program is running.